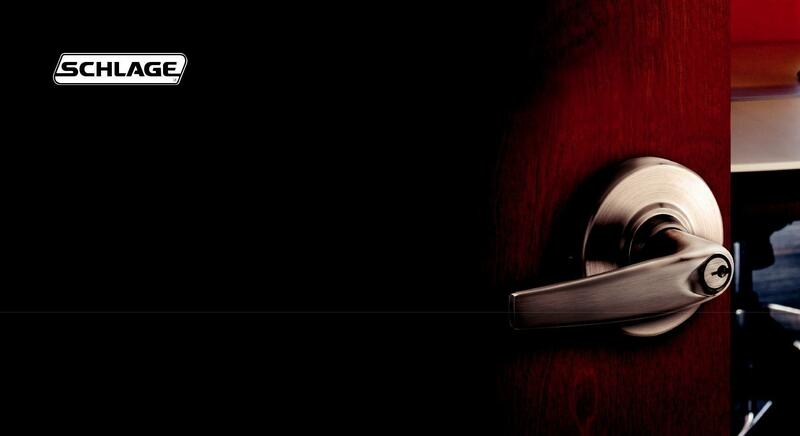 Primus XP is a sidebar cylindrical mechanism with the highest degree of protection for Schlage. Its purpose is to provide an extra level of security and control to any format of Schlage cylinder. 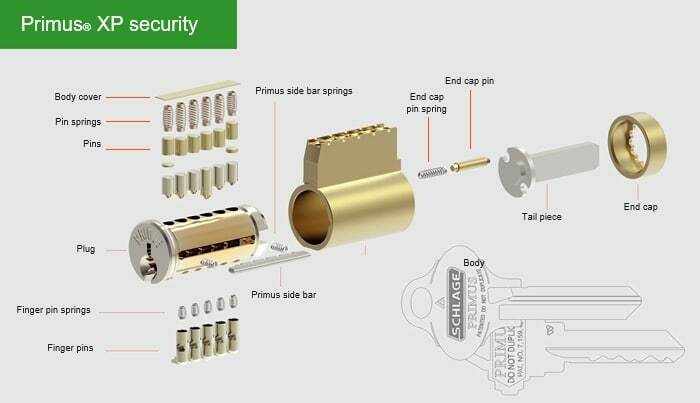 In addition to its ability to neutralize unregulated key duplication, Primus also has features that make the cylinder pick-resistant. Primus offers nine different levels of protection, making it ideal for any application where it is necessary to increase the security level. Primus XP includes products with a large number of UL437 physical security enhancements. This enables optimal use of Schlage locking security systems to ensure the highest level of protection. With Primus XP products, anyone can control the patented side bit milling design of Schlage brand locking systems individually, based on both the protection needs of their property and the geographic region in which they are located. 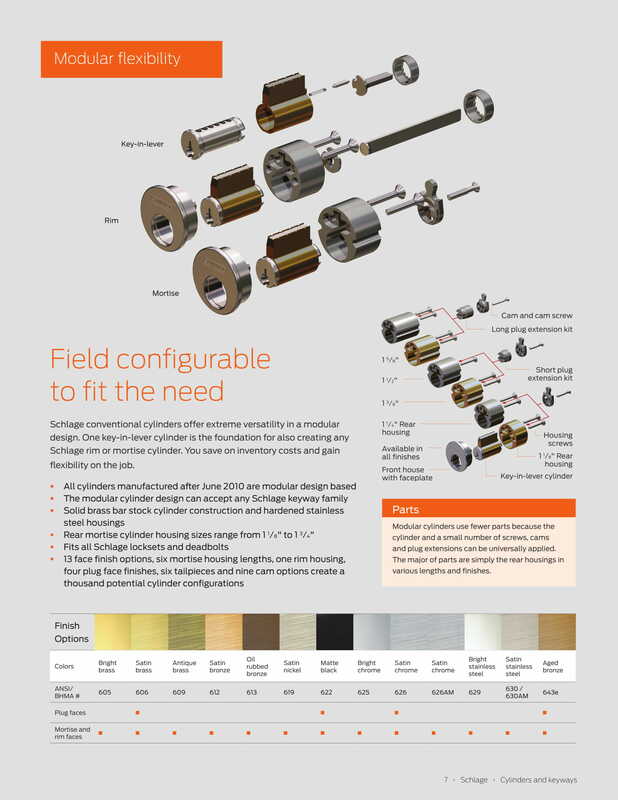 Conventional Schalge cylinders provide exceptional flexibility to the modular design, as with them, a cylinder is the basis of any Schlage key-in-lever lock system. 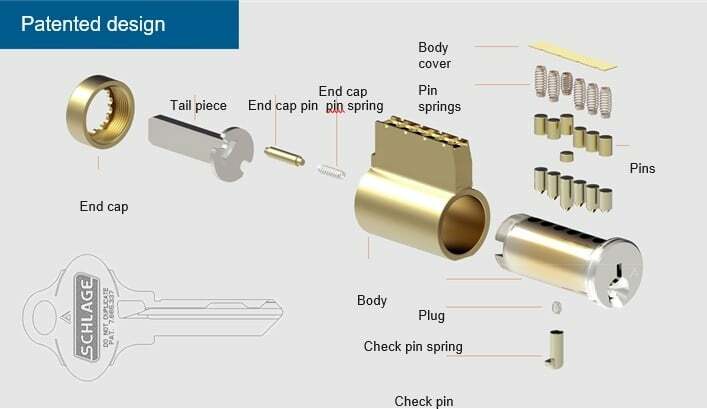 Schlage's full-size, interchangeable cores are based on the industry standard plug diameter of ½ inch.This makes them compatible with the various Schlage locking systems. The Schlage SFIC interchangeable core cylinders are based on the industry standard SFIC plug diameter size which is less than ½",. Thus, the Schlage cores can be used in place of Best, Falcon, and other SFIC cores on competitive locksets. 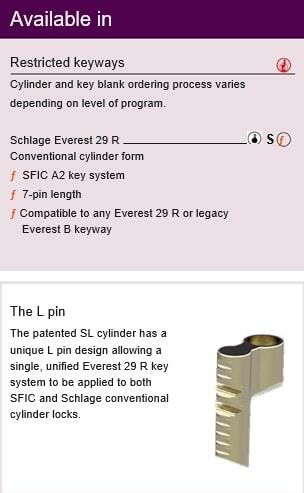 SL cylinders are full-size key-in-lever cylinders compatible with the SFIC A2 key system. 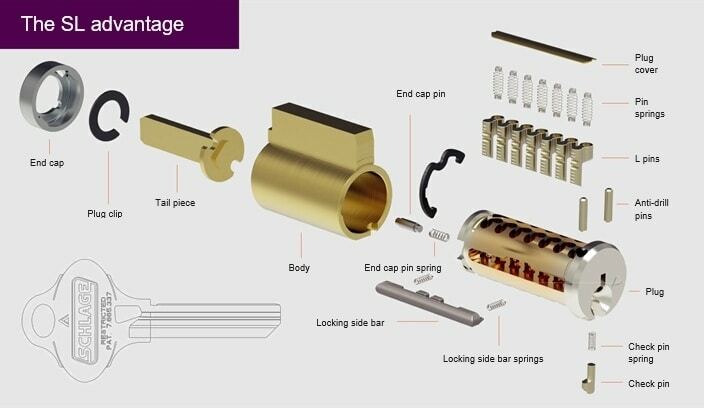 This type of cylinder allows a large number of locking systems to be unified as one without the need to replace the cylindrical lock hardware. 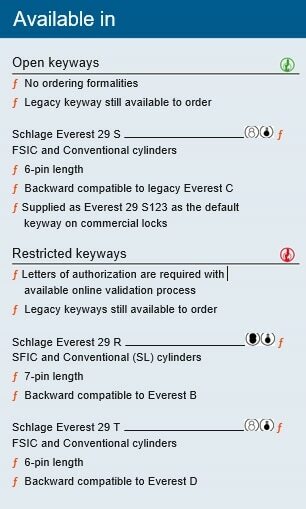 The key systems Everest 29 protect you from unwanted duplication of the key in two ways. First of all, the key parts of this series are strictly controlled by Allegion, which means that only authorized dealers have access to them. On the other hand, it is a patented product in which patent protection discourages duplication of design - a crime subject to federal law enforcement. Everest 29 systems are available both as open and restricted keys, providing the level of security you need for each application. Since many critical entry points and particularly sensitive areas require additional protection, Schlage cylinders with added Primus XP features can be used to increase the level of physical protection and administrative control. 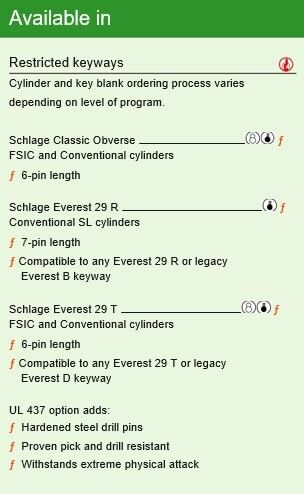 Even the open type Schlage - Classic Obverse switches can achieve the same level of physical protection offered by Everest 29 keys with Primus XP cylinder characteristics. Exclusive SL cylinder makes it possible to combine separate multi-compartment complexes into a Restrictive Key System A2 to be upgraded to a Primus XP degree of protection. Whether you use conventional key-in-lever cylinders and Small Format Interchangeable Cores (SFIC) in a building complex, you can replace conventional cylinders with new 7-inch SL cylinders and, if necessary, upgrade to Schlage's SFIC under one common locking system. Instead of replacing the installed cylindrical latches, only cylinders can be replaced, which saves labor, time and finances.